Climatic disasters do not get the same news headlines as events like earthquakes, tornadoes, tsunamis, tornados, or hurricanes. That is because they can cause a lot of death, injuries, and economic destruction in such a short matter of time. Within 30 seconds an entire city could be destroyed. But climatic disasters are different in scale, intensity, length, and scope. More often than not, climatic disasters are the deadliest of all because they can occur very slowly, occur in regions that are thousands of miles, and can last for years. Take for example the Somalia famine from late 2011 through 2012. Within that time, over 260,000 people died, most of them were women and children. Climatic disasters can bring droughts, famines, and disease. They can also be linked to human actives such as deforestation and desertification. The National Oceanic and Atmospheric Administration (NOAA) has a great website on climate called Climate.gov. Describe the basics of global circulation and how that influences global climates. Explain the causes and effects of the Indian monsoon. Describe the current state of fresh water for drinking and sanitation. Determine some of the regional climatic disasters and why they are occurring. In 1735, George Hadley understood that solar energy drives all weather. He proposed that the surplus of heating at the equator would flow towards the poles. This single-cell migration of energy in both hemispheres is caused by uneven heating of the planet and is called the Hadley cell or the Single-Cell Model. The purpose of the Hadley cell is to take this differential heating and balance it out. In the Single-Cell Model, Hadley suggested that the earth's surface is uniformly covered with water, the Sun is always over the equator, and the Earth does not rotate (no Coriolis effect.) Obviously there are a lot of problems in this model, but it was a start in understanding global pressure and wind patterns. In the 1920s, a new model was proposed to address the problems in the Single-Cell Model. In the new model, surplus heating still occurs at the equator creating a surface low pressure system in this region called the intertropical convergence zone (ITCZ). The result of this global low-pressure system at the equator creates the tropical rain forests. At 30 degrees north and south of the equator, the air migrating from the equator towards the poles begins to sink creating a global high pressure system called the subtropical high. Located in these regions of the world are the global deserts: Sahara, Gobi, Arabian, Australia, Mojave, Death Valley, Canyonlands National Park, Zion's National Park, etc. This sinking air either migrates back towards the equator (creating the first cell again called the Hadley cell) or towards the poles. Around 60-65 degrees north and south, air is forced to rise because of convergence by warm air coming from the subtropical high and cold air coming from the poles. The region of this rising air is called the polar front or polar low. This region is called the mid-latitudes and its climate tends to have all four seasons. These regions include the United States, Canada, Europe, and Russia. This rising air either moves back toward the subtropical high or poleward toward the polar high, thus completing the second cell of this model. Finally, cold sinking air from the poles, called the polar high, sinks towards the polar front creating the third cell of this model. Therefore, the modern model on global circulation is called the Three-Cell Model. What is vitally important to realize with this model is that the cells migrate with the seasons. The ITCZ is where the Sun's direct energy is hitting the planet. When the Sun's rays migrate into the Northern Hemisphere on its way toward the Tropic of Cancer (23.5 degrees North), the ITCZ migrates northward too. This compresses the three cells in the Northern Hemisphere and elongates the three cells in the Southern Hemisphere. Vise versa occurs when the Sun's direct energy migrates into the Southern Hemisphere as it marches toward the Tropic of Capricorn (23.5 degrees South). 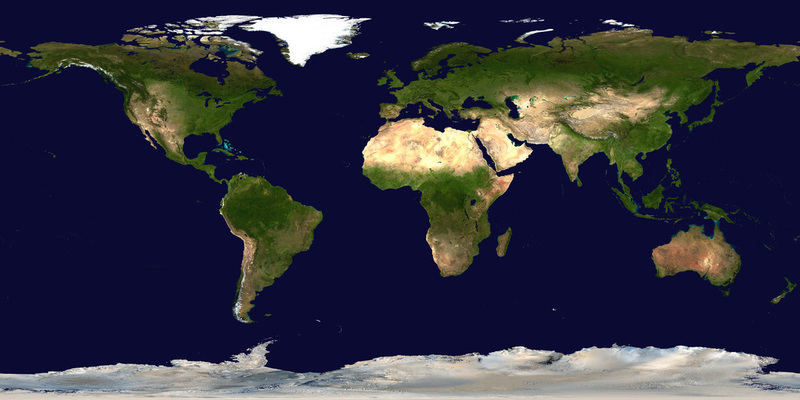 Below is an image from NASA of Earth. From space you can actually see the climatic effects of these global circulation patterns. You can see the tropical rain forests between 23.5 degrees north and south where the ITCZ migrates. You can also see that around 30 degrees north and south the global deserts occur. The polar high is quite obvious near Greenland and Antarctica. And where the subtropical high and polar high meet, you have the polar low, which dominates the weather and climate of the United States, Europe, Russian, and China. The greatest seasonal change in global circulation is the monsoon, which refers to the directional shifting of winds from one season to the next. This often brings a dry season and wet season for regions affected. Over half of the world's population lives in regions controlled by monsoons (China, India, Africa, North America, etc.) Most of these regions are agriculturally based; when the rains do not come people starve. Yet many die from floods and landslides from the monsoons. In 2007, India's monsoon killed nearly 3,000 people and displaced over 15 million! The Asian monsoon is one of the most familiar monsoons in the world. It is important to note that India is in the Northern Hemisphere. So when the ITCZ is in the Northern Hemisphere, the United States and India are experiencing summer. During the winter, the ITCZ migrates into the Southern Hemisphere as it follows the sun. At the same time, cold Siberian air begins to create the Siberian high (which is a form of the subtropical high). The clockwise rotation of this high creates dry trade winds that flow over India toward the ITCZ. At the same time, the trade winds drop in elevation (on it's way toward the Indian Ocean) and begins to warm. Thus Indian's winter monsoon creates warm and very dry conditions. In the summer, the ITCZ migrates over Asia as the sun migrates toward 23.5 degrees North (the Tropic of Cancer). This causes warm, moist trade winds coming from the Indian Ocean to migrate into India. But in order for this warm moist air to reach the ITCZ, it must rise over the Himalayan Mountains - the tallest mountains in the world. Recall that the Himalayas were created when India slammed into Asia (continental-to-continental convergence). This orographic uplift along the Himalayas causes massive amounts of water to precipitate over India causing massive flooding, landslides, and hardship. There is actually a monsoon that occurs in the western states of the United States. Just like in India, when summer occurs and the ITCZ is in Northern Hemisphere, it plants itself near Arizona. This causes warm, moist trade winds from the Gulf of California and Gulf of Mexico to funnel into the region. When this warm, moist air is heated by afternoon convection, afternoon thunderstorms develop. The hydrologic cycle is the system that creates the hydrosphere. There are six storage areas of water on Earth: the atmosphere, oceans, bodies of fresh water, plants and animals, groundwater, and glaciers. It is important to note that the hydrologic cycle (also called the water cycle) is a closed system. What that means is that the planet is not receiving any more water from space and none is leaving the planet. What matters most is where water is in the hydrologic process. The process of the water cycle is fairly straightforward. Eighty-six percent of all evaporation occurs in the ocean, while the other 14 percent occurs over land. In the process of evaporation, large quantities of heat are transferred horizontally, called advection or wind, in the form of latent heat. When the water vapor condenses, the process releases the latent heat. Seventy-eight percent of condensation occurs over the oceans, while 22 percent occurs over land. Thus large amount of heat and moisture can be transferred around the planet in a matter of days. There are serious concerns for regions of the world that have a lot of water. One of the biggest concers is one of the biggest killers on the planet - malaria. It is believed that over 2.5 billion (there are over 6.7 billion on the planet) are at risk of getting this disease every year. Another 800 million will get malaria this year and one million will die from this killer. The demographic most impacted by malaria are children; in fact a child dies from malaria every 30 seconds! The following are images of malaria from National Geographic. Malaria is a problem for regions that have a lot of rain and sitting pools of water (i.e. Africa, Indonesia, India, and South America). There is also a correlation between regions affected my malaria and their economy and standard of living. Of the 6.77 billion people on the planet, over 1 billion live in extreme povert (i.e. making less than a dollar a day). Many non-governmental organizations (NGOs) and the United Nations believe that extreme povery will never be eradicated unless diseases such as Malaria and AIDS are dealt with. As a quick note here, over 40 million people have AIDS and over 1 million will die every year. So how do you get malaria? Malaria is basically carried by female mosquitos who need to find blood for their eggs. When she bits into the skin, a malaria carrying mosquito's saliva will infect the bloodstream with parasites. These parasites will quickly search for and embed themselves into red blood cells. Within only a couple of weeks, the parasite will reproduce 40,000 times over until the red blood cell is dissolved. Once the red blood cell is destroyed, the parasites will search and find new cells within 30 seconds and the process starts all over again. So ultimately, malaria is the breaking down of your red blood cells. So what can be done about this? One way is to use bed nets. Think about it, when do mosquitoes come out - early evening and through the night. So if you can sleep in a bed net, then you are protecting yourself when you most need it. Often times these bed nets have pesticides on them so that the mosquito is killed on contact with the net. Bed nets cost less than $10, but many of these people make less than a dollar a day (some make $0.25 a day). So they can't afford bed nets. That is when organizations like the World Health Organization (WHO), The Global Fund, and Nothing But Nets comes in. The following is a YouTube video from Nothing But Nets. If you get malaria, there is medicine but again economics prevents those who need it most from getting it. Now in 2007, there was a report that scientists may be near to making a vacine for malaria. If a vacine can be created, then it's likely that NGOs like those mentioned above and the Bill & Melinda Gates Foundation, the United Nations and other nations like the United States will purchase those vacines to end this deadly disease. Click here to learn 10 facts about malaria from the World Health Organization. So what can be done about this? One way is to use bed nets. Think about it, when do mosquitoes come out - early evening and through the night. So if you can sleep in a bed net, then you are protecting yourself when you most need it. Often times these bed nets have pesticides on them so that the mosquito is killed on contact with the net. Bed nets cost less than $10, but many of these people make less than a dollar a day (some make $0.25 a day). So they can't afford bed nets. That is when organizations like the World Health Organization (WHO), The Global Fund, and Nothing But Nets comes in. The following is a YouTube video from Nothing But Nets. If you get malaria, there is medicine but again economics prevents those who need it most from getting it. Now in 2007, there was a report that scientists may be near to making a vacine for malaria. If a vacine can be created, then it's likely that NGOs like those mentioned above and the Bill & Melinda Gates Foundation, the United Nations and other nations like the United States will purchase those vacines to end this deadly disease. Click here to learn 10 facts about malaria from the World Health Organization. This is a great opportunity to discuss another important issue the world is currently experiencing, yet few in the United States know about. The world is currently facing a freshwater crisis. Do you ever go to your shower and hope the water comes on or hope water will come out of your facets? Rarely do we think about how much (or how little) usable water exists. Of all the water on the planet, 97 percent exists as saltwater in the ocean. The salt can be removed from the water, but it is expensive. But this is the only option for places in the Middle East who have the money but need clean drinking water to because the region is a desert. But for many around the world, this is not an economic option. Over a billion of the world's 6.8 billion people live on less than a dollar a day! In 2002, the World Health Organization stated that some 1.1 billion people do not have access to clean drinking water. Many of these people walk several miles a day to find any source of water. It is also important to note that over 2.6 billion people do not have access to water for sanitation, which has lead to a dramatic increase in the number of water-borne diseases like cholera and typhoid. The number one killer of children on the planet is diarrhea, which is directly linked to unsanitary conditions. Many scientists believe that by 2100, over 40 percent of the world's population - which at that time could be 9 billion - will not have access to clean drinking water. This could dramatically destabilize the world because people will obviously kill for food and water. All around the world, water tables are falling as nations deplete their ground water faster than the acquifers can regenerate. This is most dramatic in nations such as China, India, and the United States. How many of you have heard of the Ogallaoa aquifer in the central plains of the United States? It provides water for over 100 million Americans and we are currently depleting the aquifer faster than it can replenish itself. Another concern is the depleting of the world's rivers. This includes the Yellow River in China, the Nile River in Egypt, the Indus River in Pakistan, India's Ganges River, and the Colorado River in the United States. These rivers are disappearing for a variety of reasons. As the water table's drop, the springs that feed these rivers are drying up. Another major problem are dams, which are used to "store" water and for hydroelectric energy. But their are several problems with dams. First, reservoirs created by dams get filled up with sediment from the back end where rivers flow in. You also lose 50 percent of your water when you create a reservior because of the large surface area created. So even though dams are used to store water, they lose half to evaporation. In the United States, it is expected that Lake Mead will dry up by 2025 and Lake Powell will follow. So ultimately, rivers flowing from dams have less water for those downstream. The Colorado River rarely makes it to the ocean these days as states such as California, Nevada, Utah, and Colorado drain the river. This is also playing out in the China's Yellow River and Egypt's Nile River. The satellite image below is of the Aral Sea in Asia. As noted above, the United Nations estimates that 40 percent of the world will not have access to drinkable water by 2100. To take it one step further, it is believed most of the wars of the 21st Century will be fought over food and water rather than oil or politics. The biggest stresses of water will come from arid and semi-aird regions such as China, India, the Middle East, and parts of Africa. And of all places in the world, the greatest scarcity of water will occur in the Palestinian territories (i.e. West Bank, Golan Heights, and Gaza Strip), but this is based more in inequity rather than actual shortage of water. Israel's population is twice as large as the Palestinians, but Israel has seven times as much water. As with malaria, there are several NGOs that are working on this issue. One major organization is called Water Aid. Please check out how Water Aid is using Global Positioning Systems (GPS) to map water points in Africa. Another YouTube video from the One Campaign also discusses this issue. If you would like to watch more videos from Water Aid, click here. Recall that most of the world's rainforests exists between 23.5 degrees North (Tropic of Cancer) and 23.5 degrees South (Tropic of Capricorn), which is the range of the ITCZ and the powerful tropical thunderstorms that accompany it. Though rainforests occupy only 7 percent of the world's landmass, they contain within them over 50 percent of the world's species. Over 1.5 million species have been found in the rainforests, but scientists believe over 13 million species may live within them. The forests are so thick, that 80 percent of the precipitation and 99 percent of the sunlight never reaches the ground. But currently the rainforests are disappearing at an alarming rate. Recent estimates state that rainforests are disappearing worldwide at a rate of 100 yards (one football stadium) per second! How many yards of rainforests have disappearing in the time you read these notes? The reasons for deforestation are complex. Some are cut down for wood that is sent to developed nations such as the United States, China, and Europe. Other rainforests are cut down in order to raise cattle, which is usually shipped again to developed nations. But the majority of the world's rainforest are cut down for a simple reason; so the people in the region can farm for food, a process called slash-and-burn agriculture. Villagers will cut down a forest and burn the vegetation. This releases nutrients into the soil making the soil fertile for agriculture. But the soils fertility only lasts 3-4 years and then the soil's nutrients are depleted, forcing villagers to move on to a slash-and-burn a new location. Not only does slash-and-burn agriculture lead to deforestation, but soil erosion increases and once the soil is gone - it's gone. The image below from NASA shows deforestation in Thailand on November 30, 2001. Currently there has been a big push to cut down the Amazon Rainforest in South America, to grow sugarcane to create ethanol. Some of you may have heard that biofuels such as ethanol are "environmentally friendly" because the fuel is not coming from fossil fuels. But is biofuel truly environmentally friendly if it requires cutting down the rainforests? Using potential food for fuel such as corn has also dramatically increased the price of corn-based foods around the world. And humans have been consuming more food than we are producing for seven of the last eight years - obviously not a sustainable path to continue. There has been a push to reforest the rainforests, but these replacements tend to be monoculture (single species) forests that can not support the same types or amounts of species as the original rainforests. These new forests are often called plantation forests. This matters in regards to disasters in many ways. Removing vast amounts of trees can destabilize slopes and increase the chance of landslides. The lack of trees will also cause runoff to erode slopes into river systems. This excess sediment into river systems can cause many plants and animals to suffocate from the lack of oxygen available and their inability to breath through the water. Even more importantly, the world is currently experiencing the 6th largest mass extinction of all time. This has to do with a lot of reasons such as climate change, land and water use by humans, poaching, and deforestation. Over half of the earth's species live in the rain forests and the forests are disappearing at the rate of a football stadium every two seconds. When humans are destroying the land where half of the earth's species exists, logic would follow that humans are wiping out entire species. So if you want to save most of the world's species, you have to deal with issues like deforestation. But in places like Africa, deforestation is occurring because of slash-and-burn agriculture as noted above. That is because many of them live on less than $1.25 a day and they survive by farming. So to take it one step further, if you want to save the earth's species, you have to deal with issues such as extreme hunger and poverty. The National Oceanic and Atmospheric Administration (NOAA) defines a drought as a "period of unusually persistent dry weather that persists long enough to cause serious problems such as crop damage and/or water supply shortages. The severity of the drought depends upon the degree of moisture deficiency, the duration, and the size and location of the affected area." In terms of atmospheric events, droughts are the number one cause of death in the world. Floods followed by lightning are the number one killers of weather related disasters. The National Geographic Society has a video that goes over the basics of droughts. Now scientists analyze droughts from multiple perspectives. Meteorological drought is a way of measuring and analyzing droughts from a climatic perspective. That might seem obvious, but what might seem like a drought in one region of the world may not be a drought in another region of the world. So it is important for atmospheric scientists to analyze droughts based on the climate of the region. Agricultural drought analyzes a drought based on the amount of (or lack of) moisture in the soil. Farmers and agricultural scientists analyze droughts from this perspective because there isn't always a direct correlation between meteorological droughts and the moisture in the soil. Hydrological drought is a way of analyzing drought conditions based on hydrological processes (sometimes called the water cycle). Long term droughts can dramatically impact conditions such as water tables, water within rivers and reservoirs, and societal activities. Sociological drought is a way to analyze a drought based on the impact on society. This can include recreational activities, lawn care, and any other way society uses and is impacted by water. The four "droughts" noted above are all ways of analyzing and comparing the same climatic event, but from various viewpoints and perspectives. The United States Geologic Survey (USGS) and NOAA all analyze potential and current droughts. NOAA analyzes drought conditions using a system called the U.S. Palmer Drought Index, which looks at drought conditions across the United States on a weekly basis. The USGS also analyzes potential and current drought conditions on a weekly basis and is called Drought Watch. The USGS also analyzes drought conditions globally through a program called the Early Warning and Monitoring Program. The goal here is to detect potential devastating droughts that could lead to famines or desertification on a global scale. Globally in the rainy tropics, the temperature and moisture ranges very little year round. But as you move away from the equator, a distinct wet and dry season begins to develop. Refer back to the three-cell model and recall that the ITCZ and doldrums migrate northward until it reaches 23.5 degrees north (Tropic of Cancer) on June 21st. Then the ITCZ migrates southward until it reaches 23.5 degrees south (Tropic of Capricorn) on December 22nd. Large amounts of precipitation falls over a region if the ITCZ and doldrums are overhead. When the ITCZ and doldrums move away from a region, the area experiences dry conditions. These wet/dry climates are called the savannas. The savanna in Africa is one of the most popular climates in the world. Most people have seen the pictures of elephants, lions, wilder beasts, giraffes, zebras, etc. But because of poaching, population growth, sprawling cities, and changing climates, many of these species face extinction. This region also experiences severe famines. In the 1980s, the Sahel region of Africa, the transition zone between the tropical rainforests and the Sahara desert, experienced a massive and prolonged famine. Images from the BBC and other media focused the world on this famine and much was done to help. But millions still died from the famine. Then in 2002-2005, another massive famine hit the region again affecting over 10 million people. Sadly, this famine was not given the same attention as the previous famine. Many were literally searching for bugs for food! The following is a YouTube video of the famine in Ethiopia that occurred in 1984, followed by another famine in 2008. A desert, also called an arid climate, is defined as a location where evaporation exceeds potential precipitation. In fact, with the lack of cloud cover, 90 percent of all the incoming solar radiation reaches the surface. The other 10 percent is reflected back into space by the atmosphere. So if more moisture is evaporating the a region receives, it begins to dry out. Examples of world deserts that occur within 30 degrees north and south is the Sahara in Africa, the Arabian Peninsula in the Middle East, the Gobi in China, the Great Sandy Desert of Australia, and the Mojave in southwest United States. The redrock country of Utah also occurs because it is within the subtropical high. The major environmental problem facing arid deserts, called desertification. Desertification is the permanent degradation of arable (agriculturally usable) land into deserts. Most desertification is caused by humans: slash-and-burn agriculture, lack of conservation, overtaxing water supplies, uncontrolled grazing of animals, and population growth. Global warming is also taking is toll. Once fertile soil is used up or blown away, it takes hundreds of years to come back. On a global average, it takes 500 years for the earth to generate one inch of fertile topsoil! So soil is not a renewable resource. It is believed that one-third of the world's arable land is threatened by desertification, affecting over 135 million people. It is occurring all around the world, but is greatest in Africa near the Sahara Desert and the Gobi Desert in China. Below is an image from NASA that compares the health of vegetation, which can be used to determine if a region is under climatic stress. Note how the Sahel region is pretty much a transition zone between the tropical rainforests and the Sahara Desert. The concern is if the Sahara continues to expand into the Sahel region, famine conditions in the region will become more common. By 2025, two-thirds of arable land in Africa will disappear, along with one-third of Asia's and one-fifth of South America's. The United Nations has begun a global campaign to slow human induced soil erosion which leads to desertification, but it requires lots of money and education. The U.N. is educating farmers that contour plowing, terracing, and crop rotation is needed to slow soil erosion. Educating cattle farmers and nomads to move their livestock around is important. Many places around the world are planning vegetation to prevent fertile soil from blowing away. In China, they are creating a massive wall of vegetation - called the Green Wall of China - to slow the spreading of the Gobi Desert. So is this occurring in the United States. Maybe! A science report released in April 2007 states that if droughts continue in the southwestern United States, the regions deserts may also begin to expand just like they did during the 1930s Dust Bowl. In terms of scientific research, the United States is actively involved in monitoring these conditions. It was noted above that the USGS collects information through the Early Warning and Monitoring Program. At the same time, NASA has the Earth Observing System, which is a constellation of satellites that are monitoring environmental change around the planet. These satellites include the Tropical Rainfall Measuring Mission (TRMM), MODIS, ASTER, and Landsat. The MODIS image below is of a sandstorm coming off of the Sahara Desert.